Klix is a fullscreen WordPress portfolio theme that has two different color schemes included. Optional animated bokeh, floating particle, and starfield effects can be turned on/off on any background image or image slide. 120+ Shortcodes from backgrounds to columns to images and video to nivo sliders and much much more. Custom theme settings page with 50+ settings including changing fonts and easily allowing image uploads for making the site your own masterpiece. Custom AJAX contact form system with any amount of custom fields. Powerful lightbox based galleries that will show images, iframes, flash, youtube, vimeo, and hosted video. DK for Photography is a beautiful fullscreen theme with 4 different homepage styles, 10 page templates, 6 gallery page templates, 7 custom widgets, tens of built-in shortcodes, various fonts and many more layout building options. DK for photography uses Timthumb to adjust the size of thumbnails automatically. Theme supports unlimited number of sidebars, so you can create and select widgets individually for each of your page. It is compatible with all the major browsers and comes with PSD files for customizations you may need. 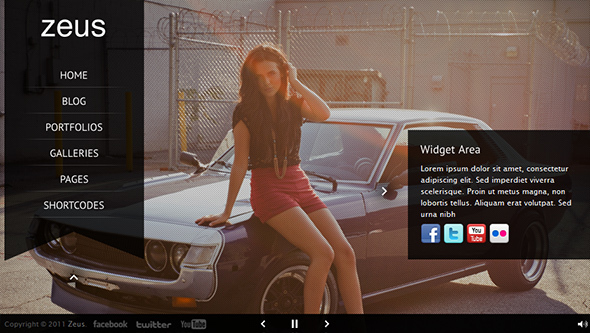 Delight is a powerful and professional WordPress theme with full screen background slideshow. It comes with with many jQuery effects (cycle, tabs, accordions, dropdown menus, tooltips, etc.). You have an ability to built unlimited number of different skins using the built-in color pickers and other useful tools. Google web fonts, individual page and post templates, drag & drop functionality, form composer, a huge number of shortcodes. These are all amazing features and it is only a bit of everything that can be done with Delight theme. 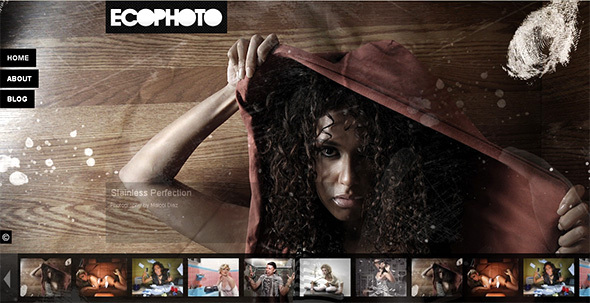 Photorific is a premium WordPress theme great for photography and portfolio websites but can also be used for other projects. With Photorific, you can set as many background images as you want for every page, post, & portfolio item. The image will be automatically stretched to fit the users browser. This theme also comes with a color picker, 30+ shortcodes, 3 widgets, an AJAX contact form, unlimited sidebars and much more. You can also choose your own fonts for regular text, and choose from 7 pre-installed cufon fonts that look great. Specere is a feature packed WordPress Theme aimed at creatives, photographers and people looking to showcase photos and images fullscreen, producing maximum impact, no fuss! Fully automated gallery. Just add your images and the theme will do the rest! Specere comes packed with an easy-to-use white label Options Panel, documentation and a full screencast video tutorial link which can be found at the top of the documentation file. Including a variety of options, King Size can suit any particular needs. Offering you five very different gallery styles (including 4 additional layout styles for ColorBox, FancyBox and prettyPhoto), with ability to blog about your photos (attach featured images) and etc. Creating a Gallery / Portfolio can’t be any easier. You just upload your images via Media Gallery (all explained in the documentation) and automatically those images are converted to the Gallery Type you have selected for that specific page. There are no extra steps, just upload your images and click publish. Well documented and user-friendly, also including 8 video tutorials to walk you through a variety of steps. If at any time you’re stumped by something contact the developers, they are ready to help. One of the distinct characteristics of Zagetti is its stylish and well-polished home page vertical slider that you can customize to showcase your beautiful portfolio. 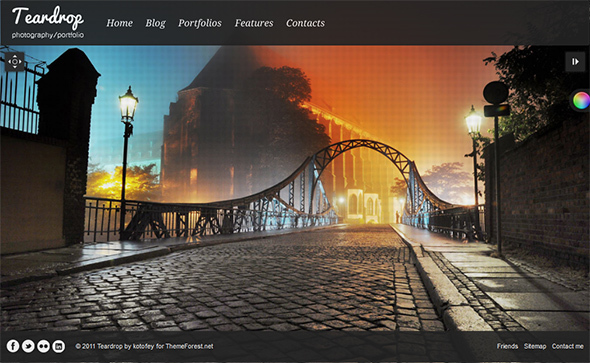 This WordPress theme is packed with several key features that can make you go ooh and aah. Go for more info to see the complete list. The Zagetti WordPress theme can give your website or even you blog a very sleek, trendy, and clean look that can truly stimulate your visitors’ visual appetite. You don’t have to be a WordPress geek or expert in order to setup Zagetti. This theme has been designed for easy installation. Teardrop theme supports video and audio playback in background as well as eye-catching image slideshows. iOS compatible, translation ready theme has a powerful admin panel to customize your site. 8 custom widgets, 55+ shortcodes, automatic thumbnails generation, etc. Make sure you try magic portfolio in theme preview. “Magic portfolio” always generates unique page layout by choosing it randomly. Try refreshing the page and you will see how does it work. The theme is well documented, so you won’t get lost. If you love photography or general creativeness and want new interesting ways to display your work then this is really the theme for you. If you are not that familiar with WordPress the video tutorials will guide you through how to create everything you need. The theme also has helpful hints throughout to let you know what every feature does. After purchasing this theme, grab a coffee and watch the framework installing everything for you. Access all curent google fonts and download additional fonts in the future using font manager. You are able to assign a different background or slideshow to each post/page/portfolio. Chocolate WP is refined and elegant WordPress theme with complex and precise combination of light gradients and shadows. It was created to serve you as unique slideshow theme to showcase your work together with strong blogging component, powered by Woo Tumblog and Express App. Outstanding fullwidth showcase-style slider for homepage, absolutely unique 2-level gallery, masonry-style layout, Tumblr-like post types, a set of custom widgets are a few of many features that are included within this theme. Fullscreen Video & Image Background wordpress theme, perfect for photographers, designers or companies wishing to display their work in an elegant and modern way. Supports video embedding, HTML5 video, audio playback in the background. 40+ Cufon fonts to choose from, 30+ shortcodes for easy content building, sidebar generator, working ajax contact form, etc. 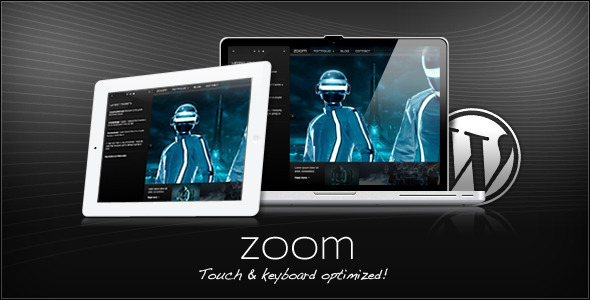 Comes with extensive documentation, videos of how to setup and make the most of Zeus theme. 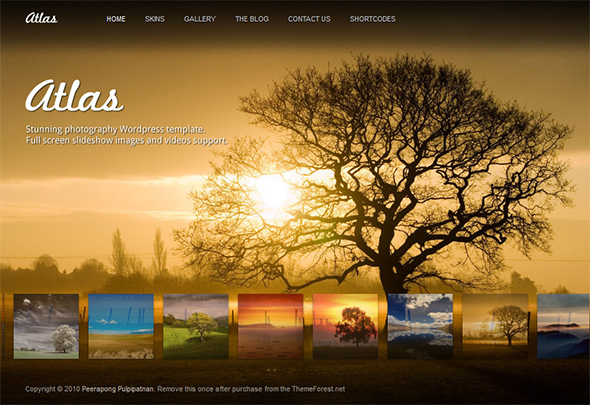 Invictus is a powerful Premium WordPress Theme for Photographer or Portfolio Websites. You can use Invictus just the way you like. The possibilities are endless! Its optimal for Photographers, Digital Artists, Designers or even Private Persons, who want to present their images in a unique Way. Invictus brings you two different Color Schemes (Black & White), nice shortcodes, easy to use theme options, a custom post type for your Photos, unlimited Color Options with color picker and a huge Font Option Panel powered by Google Font API, etc. 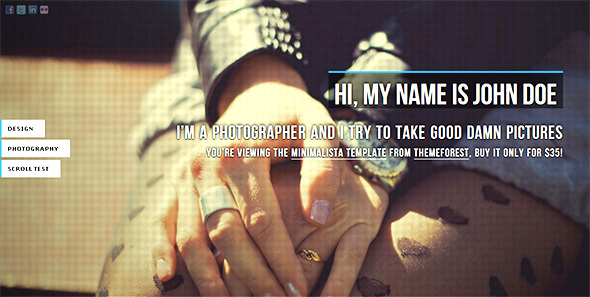 Minimalista is an Ajax WordPress portfolio theme, best suited for a profesional and minimal portfolio. The point of this template is to have a straightforward CMS like WordPress to manage a one page portfolio without any page reloading. Flash like interface, with animation for every single action you have on the website (hover, content loading, background transition, etc.). It will fit on any screen even if you resize the window, unique fullscreen slider with squared transition. Select up to 3 pictures per post or page, and your background will fade with the best transition ever on a Fullscreen Slider. Even if the URL got a hash in it, you’ll be able to send the link to a specific post or page to twitter. Use of @font-face instead of Cufon to improve speed loading of the template. You’ll have the control of each template function without editing any code. Easy to setup with detailed documentation. Adventure is a minimal photography WordPress theme with a unique look and functionality that completely ditches the standard layout. It concentrates on content and your imagery with a great range of shortcodes, theme options framework and more. Flexible custom page creation has never been easier with built-in BluePrint Page Composer. Contrast is a premium WordPress theme which is suitable for photographers, graphic and web designers, corporates with a kickass features. If you are searching for something different and out of the line, it might be the one. Now, the top selling premium WordPress theme is much more powerful with a new framework called Themolution. All the theme options are more user friendly and easy to use. There is no need to be a developer to use! Exclusive theme options panel, real-time update notifications and much more! Valid & cross browser compatible HTML5, unique horizontal scrolling layouts, working AJAX / PHP contact form, flexible page templates, 20+ shortcodes, visual editor shortcode buttons, custom widgets, unlimited sidebars and a lot more features. Multimedia Gallery “Universal” WordPress Theme is a premium WordPress theme that has built-in functionality to present your portfolio / gallery in professional way. MGU has ability to display many formats of the multimedia files – (Youtube, Vimeo, .MOV, .MP4, FLV and even MP3 ). It’s a high quality WordPress theme dedicated to those, who want to showcase eye-cathing images in the background of their sites. 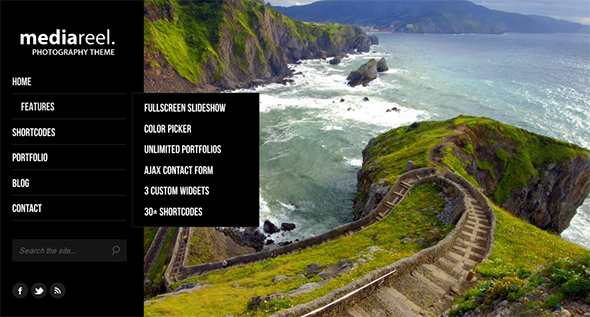 Fullscreen photography theme has a built-in background manager to manage the photos you want to display. You can be sure that the photos will fit any screen without involvement of flash stretching. There is absolutely no need to have any coding knowledge in order to use and maintain this theme. It can be customized and adjusted very easily to fit your personal needs. 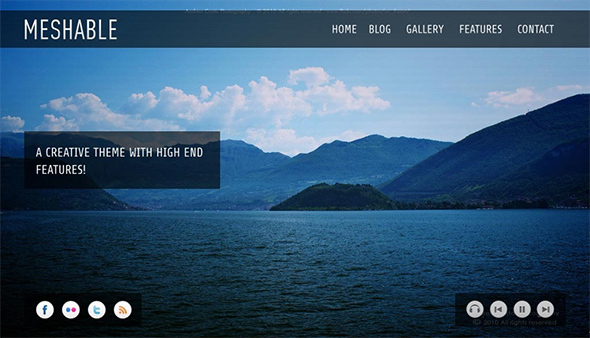 Simpolio WordPress fullscreen portfolio theme supports the latest WP features and has a lot more to offer. It is translation ready, supports having unlimited number of portfolios and video playback in background. 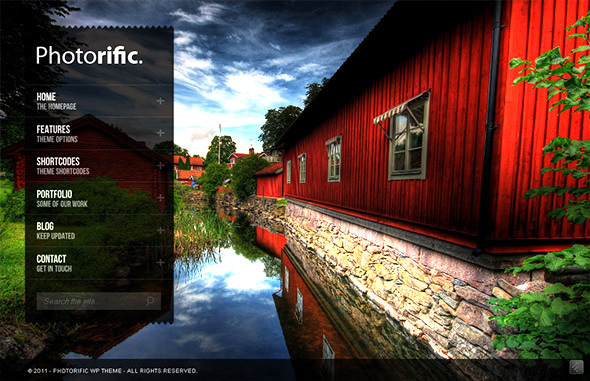 Even Flickr photostream can be shown as a background slideshow. Image slideshow has 7 amazing changing effects. Unlimited colors for headers, links and content. Easy to use color pickers are built-in. Over 50 shortcodes and shortcode manager are perfect for quick and easy content building. Cufon font replacement for headings with 37 sleek and modern fonts. Black Label is a fullscreen WordPress portfolio theme that supports image slideshow and video playback in the background. There is also a possibility to set audio background to playback music while viewing images, so it might be a perfect solution for various kind of sites. The theme was built on HTML5 & CSS3 and it is 100% compatible with all the major browsers. 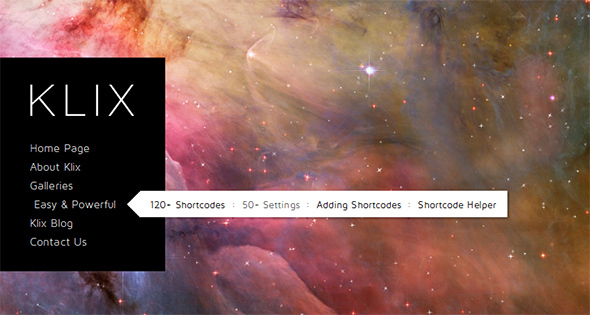 Over 30 custom shortcodes are included together with amazing shortcode generator. Black label theme is translation ready, has built-in contact form, cufon font replacement, jQuery dropdown menus. Video documentation and PSD files are also included in the package. MediaReel is a powerful, premium fullscreen background WordPress theme, great for photography and portfolio websites but can also be used for other projects. There is an ability to upload unlimited number of images for each page, post or portfolio item. This theme is very easy to customize using some simple tools like color picker. Choose your own colors for navigation links, dropdown menus, logo, text color, link color, headings and much more. Powerful slideshow options guarantee that the images are presented where you want them, how you want them to be displayed. James is comprehensive and unique WordPress portfolio theme that speaks for itself. 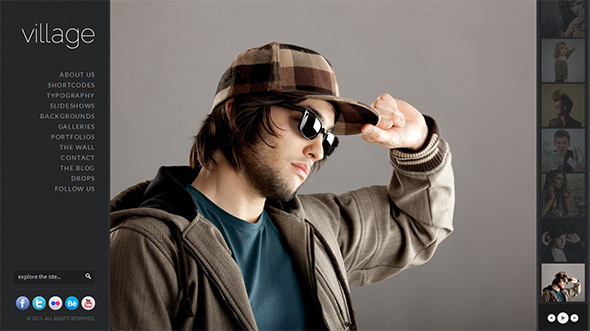 Fresh and extravagant look is ready to grab the attention of your audience. This theme contains everything you need to surprise and impress your clients. James also provides an easy solution to sell your work online. Floating photo bricks, Light Box photo effect and various types of media is a stunning combination. There is an ability to choose from several pre-defined homepage brick formats. 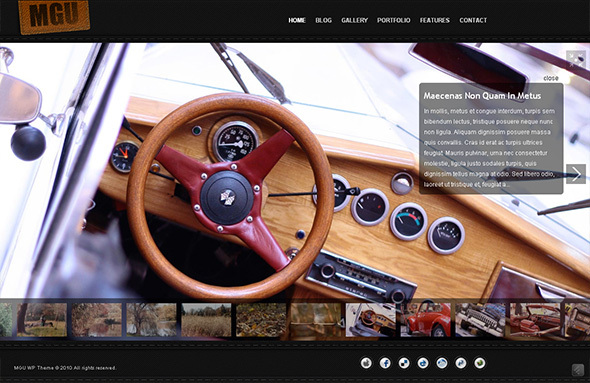 Fullscreen portfolio can be used to display a gallery of photos, videos, websites, maps, etc. 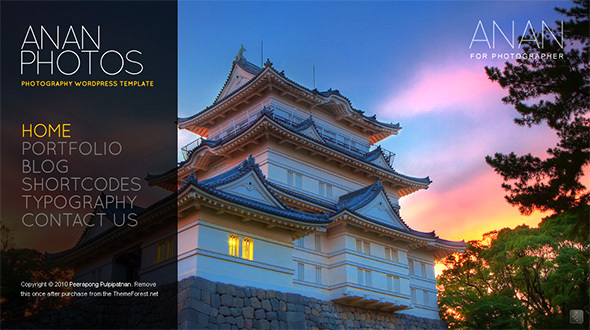 Atlas is a premium WordPress photography theme built with the latest WordPress features. 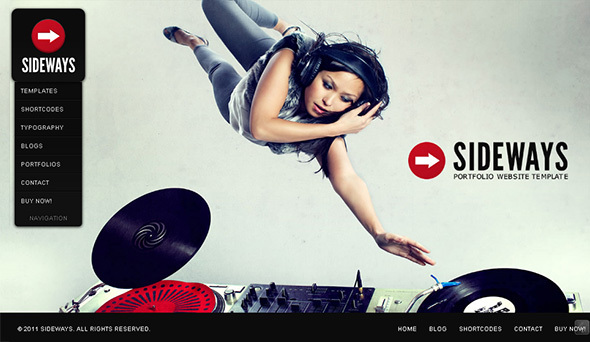 Theme comes with 4 different homepage styles and fullscreen slideshow for your pictures. 30 header fonts are include and a font manager for custom fonts. Gallery manager is very easy use, supports multiple image upload. Atlas has some interesting and unusual features like password protected gallery or unlimited sidebars. Portfolio content supports videos, images and text. 8 functional custom widgets to display social media profiles, twitter feed, Flickr photostream and more. Many shortcodes are included for rich content building. Panorama is focused on showcasing high resolution and quality photos. If you want a paginated fullscreen background gallery on your homepage or inside the post, it is all done very simple with Panorama theme. 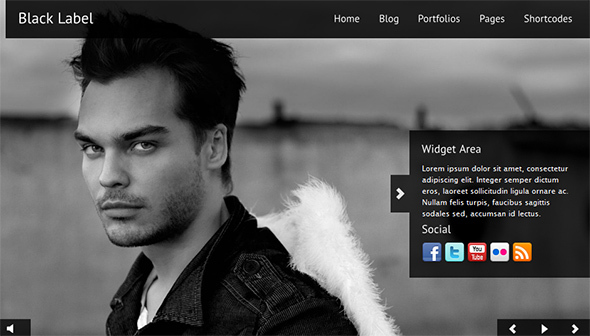 By using this theme you can have a very well organized portfolio. Many of the latest WordPress themes come overloaded with options gallore that transform a theme into a CMS inside another one. It’s a bit confusing for unexperienced user, so Panorama developers tried to keep things simple and let the WordPress platform to be the leading part. PictureThis is a powerful, premium WordPress theme, great for photography and portfolio websites, but can also be used for other projects. 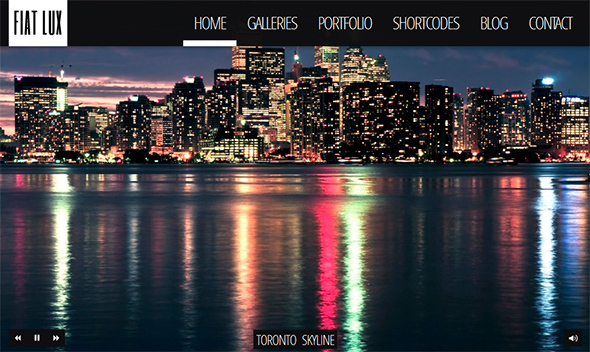 Fullscreen background image slideshow, you can upload unlimited images for each page/post/portfolio item. Choose your own colors with color picker. 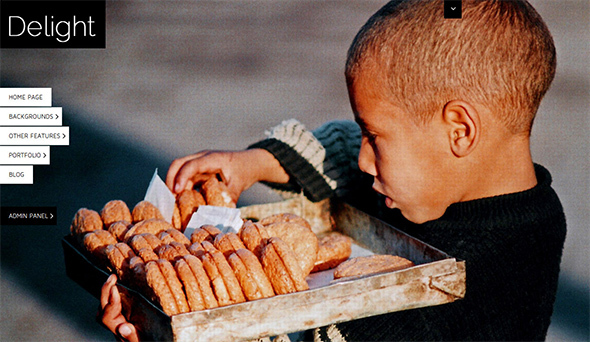 Flexible slideshow, lightbox and portfolio options to make sure the effects are used effectively, the way you want. Find a huge list of available features on PictureThis product page. 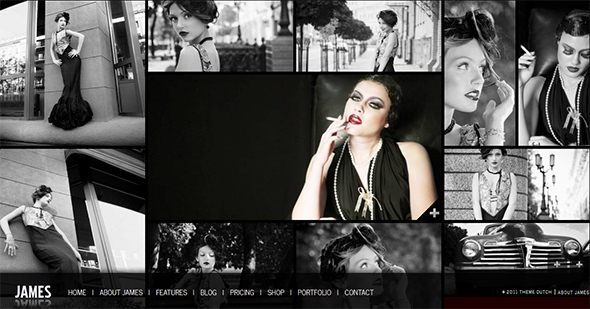 ANAN is the premium photography, portfolio, personal website template built with latest WordPress features in mind. Custom post type, unlimited colors and custom image uploader. Front-end has a beautiful full screen slideshow for a photo gallery, unlimited colors with built-in color picker, unobtrusive jQuery-powered effects, contact us page with validation and ready to use PHP mailer. 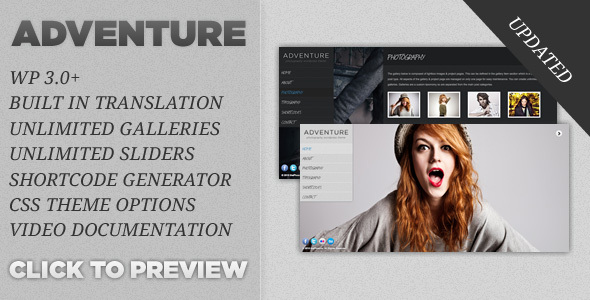 Theme has a feature-rich options panel, 30 different header fonts, built-in font manager, extensive galleries admin, 4 portfolio styles, 8 custom Widgets, built-in many shortcodes, Timthumb automatically thumbnail support, etc. 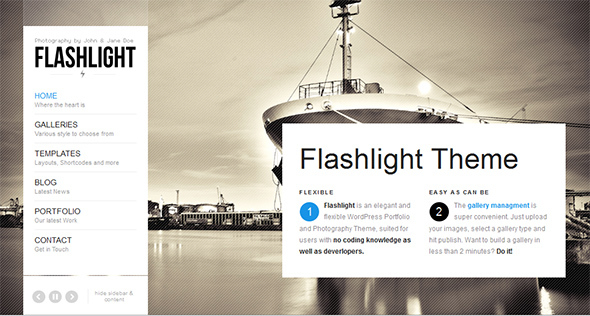 Flashlight is an elegant and flexible WordPress Portfolio and Photography Theme, suited for users with no coding knowledge as well as deverlopers. The theme comes with a plethora of options so you can modify layout, styling, colors and fonts directly within the backend. The gallery managment is super easy and convenient. Just upload your images, select a gallery type and hit publish. The Fullscreen Slider will adapt to the screen resolution of your visitors and other than with other themes, will perform very fluid transitions, even on large screens with resolutions of 2500 pixels and above. 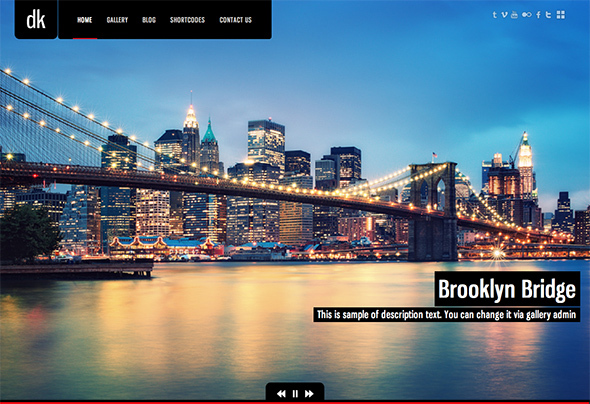 Fiat Lux is another elegant theme for making fullscreen image and video websites. Minimal design yet higly customizable in backend, Fiat Lux lets you create an unlimited number of color schemes and choose one of 11 pre-built templates when crafting your content. Great for photographers, artists and basically everyone, who want to dislay high resolution pictures in the background of the site. Fiat Lux is WordPress 3.2+ compatible, ready to amaze its users with never-ending list of features. Find out yourself by clicking the “more info” button. Artboard is a fullscreen WordPress portfolio theme with a full featured blog that leverages the best that WordPress 3.2 has to offer. 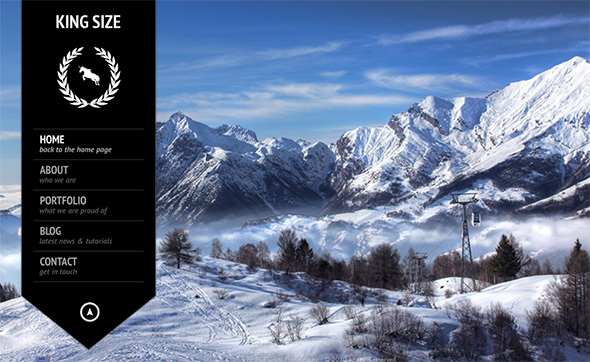 Powerful jQuery slider, stylish font replacement, responsive front page design. 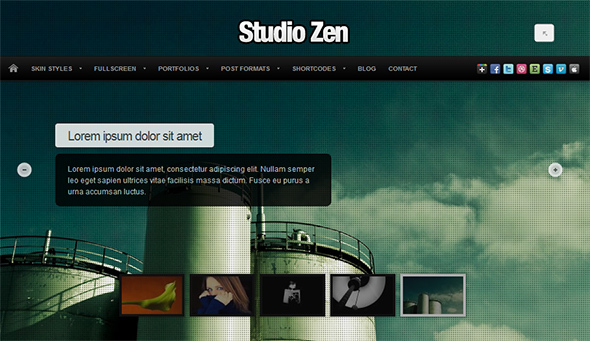 Studio Zen is a powerful theme dedicated to photographers and creative individuals. 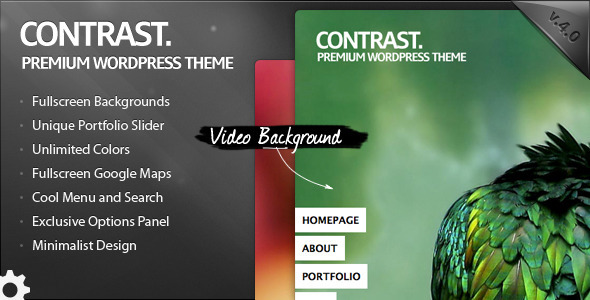 Theme features fullscreen slideshows with audio playback. It supports video playback from Vimeo and youtube, as well as any HTML5 video can be included. Fullscreen focus view toggle clears all the other elements from the screen for the best presentation. Portfolio includes a horizontal slide scroller with captions. There is also a transparent fullscreen template where slideshow shortcodes and thumbnail galleries can be displayed. 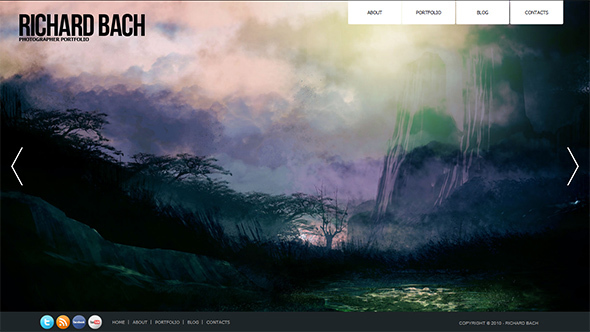 Meshable is a professional and creative WordPress theme with high end features. This theme is designed with new valid HTML5 semantic tags and it works greatly on all leading browsers today. This theme is specially designed for photography and personal sites, however this theme will suit needs of most type of sites if proper background is used. This theme is iPad compatible. It comes with 3 different background options – single image background, slideshow background and video background. Background audio with playlist and unlimited number of tracks for each page is also available. I know it’s often better to choose a premium theme, because they are safe and amazing, but there is really no free wordpress theme that display fullscreen image in the background ? Loved this list! And you’re right, I’ve looked high and low for a decent free full-screen portfolio theme, with no luck. We’re working on a few that we plan to release sometime in December, though. I’ll leave another comment when we release our themes. Worth adding to your list I hope? We’d love feedback from your readers on ease of use, etc., as we created a custom admin panel specifically for these themes. Great collection. I like the Slideways Portfolio theme! thanks for the list! the king size is awesome. I had to modify once Adventure theme. If you just want to use it – ok, if you want to modify it – it’s really painful. Oh, that’s a shame then. Could you tell me more why it was difficult to modify? Sometimes, it is good to double check all the options available within the settings panel. I consider myself as careful person, but even I once or twice performed code corrections before thoroughly exploring the settings. building a non profit site, love foundation theme- can’t seem to be able to get the images I upload to show in the slider- any clues? Its really gr8 list & have saved alot of my time. When you are not sure if the theme you selected has a certain feature you need, you should contact theme author on the product page and ask about it. The same with customizations, theme authors are often open for such requests. Very very nice templates. thank you very much. Thank you for such a good research, it helped a lot!.. cheers my friend! really nice collection, thanks for putting this together! I tried to modify the Atlas theme. Aesthetically beautiful? No doubt. Ease of modification – definitely not! It is a NIGHTMARE to modify – I tried to install another lightbox (it has Fancybox installed) and it is so heavily imbedded it’s a monster of a task to disable/remove. I think I’ll probably invest in King Size just because I know it offers different Gallery Styles – it may be worth including the Gallery styles each theme offers. It may not apply to those who just want a theme but to the others who like to get involved on the coding side, it would help a lot. Thank you for a solid list. Im very happy that i found your blog… Thanks for the awesome collection ! I just came across this list, as I was searching for a new theme for my wife’s site. You’ve assembled a great list, and I will have plenty of examples to see if any pique my wife’s interest. Very, very nice themes.! Thanks.! This list is pure gold dust!!! I liked many personally and going to buy them for my clients, thank you for saving me some incredible time.